The path towards a more sustainable, plastic-free existence feels a little overwhelming. Your weekly food shop seems to consist of plastic wrapped around yet more plastic before arriving at the foodstuff you actually want to buy. Gone are the days where you could buy all of your grocery shopping from one supermarket, now we have to do our fruit and veg shopping at local farmers’ markets or greengrocers. Pasta, rice and cereal can be bought from your local zero waste shop, if you’re lucky enough to live near one. Bread from a local bakery. Milk delivered by your local milkman. I am reasonably new to all of this and I admit it feels difficult, but I have discovered three small changes that are easy to make and won’t break the bank. First of all, buy yourself a reusable water bottle. There are plenty on the market and they are really easy and affordable to buy. If you are in the habit of buying bottled water every day or when you’re in the gym then this is definitely the swap for you. A lot of cafés and bars will also refill it for you if find yourself on empty while you’re out and about. There’s even a map which will show you what places in Bristol will do this for you (https://refill.org.uk/). The one I have is stainless steel and double walled meaning that it keeps cold water cold for 24 hours and hot water hot for four. But you don’t need one that fancy, there are cheaper alternatives depending on your budget. Second, buy a reusable coffee cup. If you’re frequently buying coffee in the little takeaway cups then this is your swap. Those takeaway cups are made from both plastic and paper and need to go to a special facility to be recycled, so chances are they end up in landfill. Reusable coffee cups can also be bought reasonably cheap and most cafés, and coffee shops will offer a discount if you have one. Boston Tea Party won’t even sell you a hot drink in a single use cup anymore, but don’t worry, if you turn up without one you can always ‘loan’ one; https://bostonteaparty.co.uk/cups/. I also use mine to take a coffee from home with me on the way to work, keeping my hands warm at the bus stop in winter and saving me money too. The last tip is to take your own cutlery out with you. 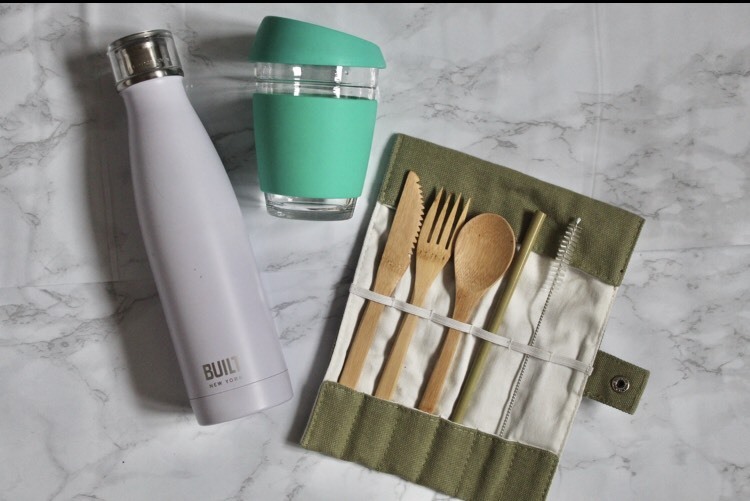 If your lifestyle means you sometimes have to buy lunch on the go then having your own cutlery means you don’t have to use the plastic ones on offer from certain cafés. I have this handy bamboo set that I take with me in my handbag. To be honest, my work’s café is down a flight of stairs so if I need cutlery to eat my packed lunch then my bamboo kit facilitates my laziness and means I don’t have to walk down stairs… There’s no reason you can’t take your own cutlery from home though in your bag. Reminds me of the scene in Friends when Joey pulls out a fork out of his jacket to eat the cheesecake. We laughed then, but makes so much sense now. These small steps probably won’t save the world on their own, but if everybody made these small swaps then they’d have a much bigger impact. They’re excellent steps towards living a more sustainable, plastic free and environmentally friendly existence.